Himanshak Chawla of class VI C of St. Mark’s Sr. Sec. 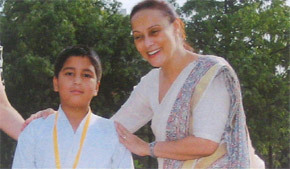 Public School, Meera Bagh joined Karate in 2010. Since then he has won many championships. He won a Bronze medal in State Level Championship held in July, 2010. Then he played at the National level winning a gold medal in the month of October, 2010. He went on to play the Indo – Nepal tournament in the month of January, 2011 and won a silver medal. He played the NCR tournament and was awarded a gold medal in May, 2011. He also played in the International tournament and won a gold medal in the month of October, 2011. Last but not the least he had won a bronze and a gold medal in June, 2010 and October, 2011 respectively for his Best Performance in Karate. In all he has won 4 gold, 1 silver and 2 bronze medals. Pawan Gidwani of class VI C of St. Mark’s Sr. Sec. Public School, Meera Bagh has shown an outstanding performance in Martial Arts (Karate Da (Kumite)) Kenpo Kai. He was awarded a gold medal in the Ist International (Indo – Nepal) Martial Art Championship (2011) organized by Martial Art Foundation of India (Regd.) held on 16 and 17 April, 2011. He won a gold medal in the 12th National Karate and Kick Boxing Championship 2011 organized by Hind Karate Do Association held on 16 and 17 July, 2011. He was awarded a gold medal at the 7th All India Independence Cup Karate – Do Championship – 2011 held on 12 and 13 August, 2011. Last but not the least he had also won a bronze medal at the Tang Soo Do 3rd GTF International Championship – 11 held on 16 and 17 October, 2011. Prateek S. Suri, student of class IVA of St. Mark’s Sr. Sec. Public School, Meera Bagh, started learning Karate at the age of 6 years. A keen learner and consistent performer, he’s been winning various competitions since then. He won the First position in All India Seiko–Kai-Karate-Do Championship in May 2009. Also ranked 4th KYU and awarded the Brown Belt in May 2009, he won the First position in 9th Delhi State Karate-Do—Championship Kad Fight and was awarded a cash prize of Rs.2500/-. Skating is his other interest and he won the third position in Skating in Jan. 2009.